A look at the legacy of a man and his music. While I’ve been familiar with their name for some time, most often hearing it spoken with reverence, I can’t say that I’m all too familiar with the music of Morphine. I wasn’t even aware of the fact that their lead singer, Mark Sandman, had passed away in 1999. 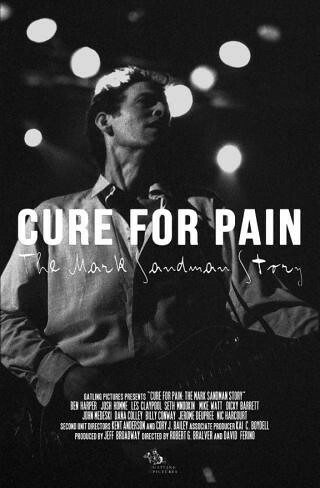 Needless to say, I found Cure for Pain: The Mark Sandman Story, which takes its name from the band’s 1993 album, to be quite an enlightening documentary and through watching it, I learned more than a thing or two about the music Mark Sandman and his band mates created as well as the passions and life-altering events which drove this enigmatic indie rock icon to achieve creative and personal heights during his time spent on Earth. Through interviews with various family members, friends, and admirers, including Les Claypool, Josh Homme, Ben Harper, and Mike Watt, the filmmakers paint a portrait of Mark Sandman as a non-conformist and an artist from an early age. After leaving home as a youth to live a vagabond lifestyle, Sandman hired on as a fisherman in Alaska and also traveled through Belize and Brazil, working his way through South America before returning home to Boston. Losing two brothers, he found a surrogate family in his band mates and unlike so many others who use personal tragedy as a reason to wallow in self-pity and grief, Mark Sandman recognized the privilege he had been granted and chose to make the most of his life. After several bands which garnered respect and attention, but not fame, it was the unlikely combination of drums, baritone sax, and a two-string bass, combined with Sandman’s introspective lyrics, which propelled Morphine to stardom in the 1990s until his untimely death onstage in 1999. The film seems to serve a twofold purpose. Firstly, it is a worthwhile introduction to the music of Morphine and secondly, it attempts to give us a look inside the band’s founder. While it would’ve been easy to simply mythologize the man (and to some extent, the film does do so), the folks who made Cure for Pain try to give us as even of a look at Mark Sandman as possible - no doubt a challenging task when dealing with a man as notoriously private as the late songwriter. We see a man who, though troubled as a youth, used music as a catharsis and managed to make peace with and eventually grow closer to the family he had previously ostracized. Lest you think it's all wine and roses, there are also a fair amount of folks who point out that Sandman was prone to stubbornness and no stranger to bitter arguments with those he worked with and respected. While it isn’t a complete picture of the man, it does its best to be a well-rounded one. In its other intent, the film excels. As I stated earlier, Morphine was a band I’d heard of but never actually heard. Cure for Pain rectifies that situation, giving a decent overview of their path to (relative) fame and most importantly, showcasing their music as much as possible. And it worked - I found myself suitably impressed by their odd blend of pop, blues, and jazz, and embarrassed by the fact that I was so unfamiliar with their work and dedicated to improving that situation. While the film itself seems to struggle at times as it attempts to flesh out the life story of a man noted for being intently reclusive, it absolutely succeeds in keeping his legacy alive by getting Morphine’s music into the ears of new listeners and, through the variety of interviews with other musicians, showing how and why that music was so well respected. At the end of the day, I have to assume anyone with an interest in music would find Cure for Pain worth a viewing and it would undoubtedly be a must-have for Morphine fans. It’s a quality look at a somewhat forgotten band that made an indelible mark on anyone who heard them and who perhaps deserve a bit more mainstream recognition than they got the first time around. Cure for Pain is available on DVD on Oct 23.